At a time when most of those who run art galleries are sipping cocktails on a beach besides those who run the fashion world, Haunch of Venison’s impressive London premises at the Royal Academy is still offering London audiences a museum-scale show by the eminent Portuguese artist Joana Vasconcelos. Spread through the numerous connecting spaces and the individual period rooms, Vasconcelos’ distinctive crochet-covered forms take on an even more loaded meaning in relation to the building, perhaps nowhere more so than with crocheted grand piano that stands in a wood-panelled room. It’s immediately recognizable form – entirely within the context of exactly such a room of specific decorative finishes rather than dislocated in a white cube- seems to be playing contrapunto to the tension between the much more abstracted colossal work hanging and the main grand marble staircase over which it hangs. And, indeed, Vasconcelos’ discourses about domesticity and fetishism of the female homemaker variety gain a new resonance where her individual works that clad existing ceramics in meticulously constructed crochet are place thoughtfully and sparsely in rooms that bristle with nineteenth century penchants for overblown decoration. If the result is one in which there is an ease of access for a popular audience, it is also a body of work that demonstrates a strong consciousness of developments in art, ranging from the personal reworking of notions of ‘the readymade’, through to entering into discussions about art and social economics. These are works that not only speak of histories of European decorative arts and their relationship to ‘fine art’, but, in a context of global transfers of capital, they intuit issues implicit in the disparities of consumption and consumer power. 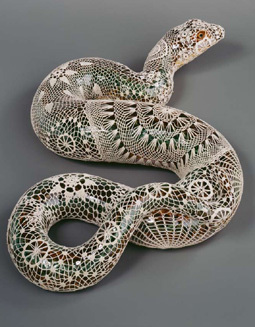 Conscious of the bad pun, we might say that Vasconcelos is actually working with relational aesthetics: there is a an eye turned towards the cruelty with which life unfairly accords severely differing worth to the most treasured aesthetics experiences of different sectors of the human population. The second layer of juxtaposition, physically, in the form of the crochet sheaths that surround these objects, develops the complexity even further. Obviously, they can denote the same discourse on taste and art in the broadest sense. But in the additional context of global economies, they seem to denote issues of skill, labour and economy. These are the painstaking and skilled crafts for which we would expect to pay a fortune in developed regions whilst readily exploiting labour to undertake the same activities in poor regions in order to feed low-rent consumer markets within wealthy economies. Or, closer to home, these are the crafts undertaken – and subsequently undervalued- by a traditionally oppressed female population. Vasconcelos’ work hardly hides its feminist prompts. In fact, it’s openly evident in the work. Yet, as with other women artists rising to the top of their game, this is not the feminism of pure victims of male oppression. At the very least, her work readily raises the question of who has constructed these elaborate traps – nets, shrouds and sheaths- that engulf female figures. Men? Almost certainly not. If these intricate crochet forms are a form of imprisonment, it is one constructed by a female craft and skill. And it is one that can just as easily harness and control male symbols such as the jackal, bull or phallic snake. Women, like Arachne, weave the webs. But, these webs are not unequivocally traps. They are ambivalent and speak of seduction and the power to seduce. In exactly the way that crochet, lace, devoré or any other textile technique that constructs something pretty or beautiful by covering, they are techniques in which the impact relies as much on what is not there; the gaps. They are like a cleverly constructed dress. The respectability for conforming to age-old codes demanding that women cover their flesh obeyed on one hand; the very same code undermined by the holes left behind. If atomic science has taught us that the universe is actually largely composed of the gaps, women, it seems, have known how to harness the power of an intuitive understanding of a structure composed as much of absence as presence for centuries. Vasconcelos’ bright figurines become all the more alluring for what we cannot see of their uncovered form. This underlying understanding of the traditional ways in which we read certain crafts and decorative aesthetics is an implicit part of the work. Only once the associations have been made with well-behaved women dutifully conforming to their traditional crafts in a suitably compliant manner can we see how Vasconcelos undoes the illusion by drawing our attention to other possibilities. 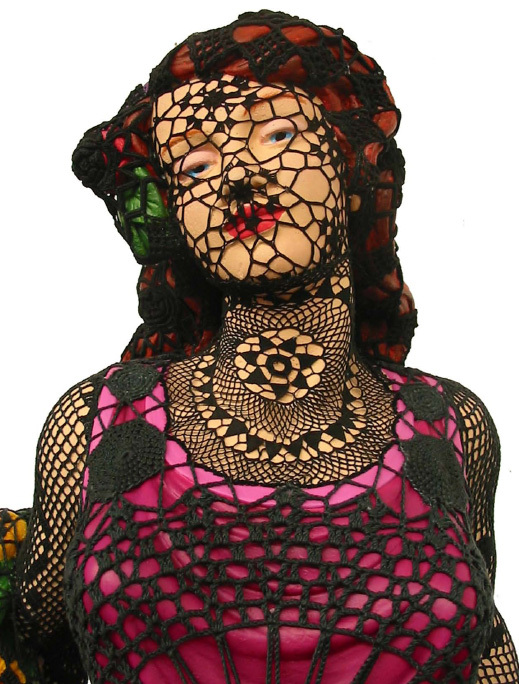 Sexuality, even if repressed and imprisoned, seems to be very present for whichever unseen women laboured on these epic works of crochet or textile manipulation.